Matrix metalloproteinase processing of PTHrP yields a selective regulator of osteogenesis, PTHrP1-17. Parathyroid hormone-related protein (PTHrP) is a critical regulator of bone resorption and augments osteolysis in skeletal malignancies. Here we report that the mature PTHrP1-36 hormone is processed by matrix metalloproteinases to yield a stable product, PTHrP1-17. PTHrP1-17 retains the ability to signal through PTH1R to induce calcium flux and ERK phosphorylation but not cyclic AMP production or CREB phosphorylation. Notably, PTHrP1-17 promotes osteoblast migration and mineralization in vitro, and systemic administration of PTHrP1-17 augments ectopic bone formation in vivo. Further, in contrast to PTHrP1-36, PTHrP1-17 does not affect osteoclast formation/function in vitro or in vivo. Finally, immunoprecipitation-mass spectrometry analyses using PTHrP1-17-specific antibodies establish that PTHrP1-17 is indeed generated by cancer cells. Thus, matrix metalloproteinase-directed processing of PTHrP disables the osteolytic functions of the mature hormone to promote osteogenesis, indicating important roles for this circuit in bone remodelling in normal and disease contexts.Oncogene advance online publication, 3 April 2017; doi:10.1038/onc.2017.70. PTHrP(12-48) Modulates the Bone Marrow Microenvironment and Suppresses Human Osteoclast Differentiation and Lifespan. Bone is a common site for metastasis in breast cancer patients and is associated with a series of complications which significantly compromise patient survival, partially due to the advanced stage of disease at the time of detection. Currently, no clinically-approved biomarkers can identify or predict the development of bone metastasis. We recently identified a unique peptide fragment of parathyroid hormone-related protein (PTHrP), PTHrP(12-48), as a validated serum biomarker in breast cancer patients that correlates with and predicts the presence of bone metastases. In this study, the biological activity and mode of action of PTHrP(12-48) was investigated. Sequence- and structure-based bioinformatics techniques predicted that the PTHrP(12-48) fragment formed an alpha helical core followed by an unstructured region after residue 40 or 42. Thereafter, detailed structure alignment and molecular docking simulations predicted a lack of interaction between PTHrP(12-48) and the cognate PTH1 receptor (PTHR1). The in silico prediction was confirmed by the lack of PTHrP(12-48)-stimulated cAMP accumulation in PTHR1-expressing human SaOS2 cells. Using a specific human PTHrP(12-48) antibody that we developed, PTHrP(12-48) was immunolocalized in primary and bone metastatic human breast cancer cells, as well as within human osteoclasts (OCL) in bone metastasis biopsies, with little or no localization in other resident bone or bone marrow cells. In vitro, PTHrP(12-48) was internalized into cultured primary human OCLs and their precursors within 60 minutes. Interestingly, PTHrP(12-48) treatment dose-dependently suppressed osteoclastogenesis, via the induction of apoptosis in both OCL precursors as well as in mature OCLs, as measured by the activation of cleaved caspase 3. Collectively, these data suggest that PTHrP(12-48) is a bioactive breast cancer-derived peptide that locally regulates the differentiation of hematopoietic cells and the activity of osteoclasts within the tumor-bone marrow microenvironment perhaps to facilitate tumor control of bone. Conventional and microwave-assisted SPPS approach: a comparative synthesis of PTHrP(1-34)NH(2). Attracted by the possibility to optimize time and yield of the synthesis of difficult peptide sequences by MW irradiation, we compared Fmoc/tBu MW-assisted SPPS of 1-34 N-terminal fragment of parathyroid hormone-related peptide (PTHrP) with its conventional SPPS carried out at RT. MWs were applied in both coupling and deprotection steps of SPPS protocol. During the stepwise elongation of the resin-bound peptide, monitoring was conducted by performing MW-assisted mini-cleavages and analyzing them by UPLC-ESI-MS. Identification of some deletion sequences was helpful to recognize critical couplings and as such helped to guide the introduction of MW irradiations to these stages. Rizzolo F, Testa C, Lambardi D, et al., J Pept Sci. 2011;17(10):708-14. 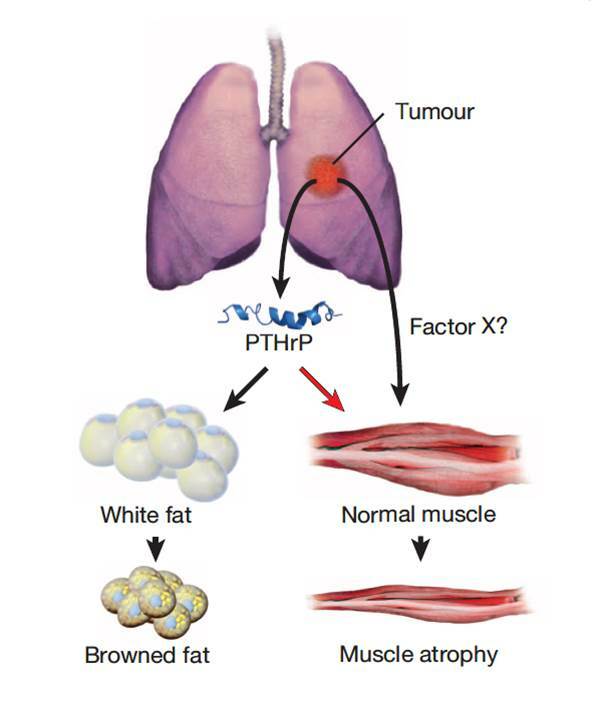 Tumour-derived PTH-related protein triggers adipose tissue browning and cancer cachexia. Cachexia is a wasting disorder of adipose and skeletal muscle tissues that leads to profound weight loss and frailty. About half of all cancer patients suffer from cachexia, which impairs quality of life, limits cancer therapy and decreases survival. One key characteristic of cachexia is higher resting energy expenditure levels than in healthy individuals, which has been linked to greater thermogenesis by brown fat. How tumours induce brown fat activity is unknown. Here, using a Lewis lung carcinoma model of cancer cachexia, we show that tumour-derived parathyroid-hormone-related protein(PTHrP) has an important role in wasting, through driving the expression of genes involved in thermogenesis in adipose tissues. Neutralization ofPTHrP in tumour-bearing mice blocked adipose tissue browning and the loss of muscle mass and strength. Our results demonstrate that PTHrPmediates energy wasting in fat tissues and contributes to the broader aspects of cancer cachexia. Thus, neutralization of PTHrP might hold promise for ameliorating cancer cachexia and improving patient survival. Kir S, White JP, Kleiner S, et al. Nature. 2014;513(7516):100-4. A Switch from White to Brown Fat Increases Energy Expenditure in Cancer-Associated Cachexia. 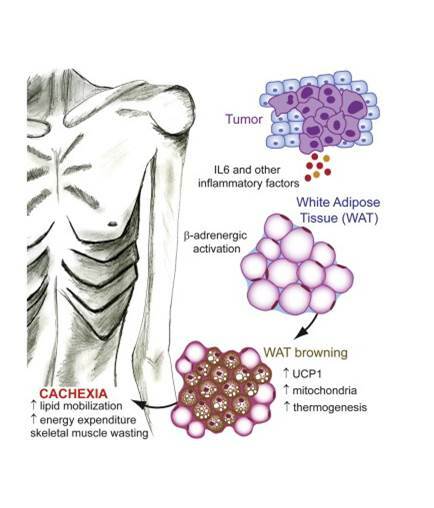 Cancer-associated cachexia (CAC) is a wasting syndrome characterized by systemic inflammation, body weight loss, atrophy of white adipose tissue (WAT) and skeletal muscle. Limited therapeutic options are available and the underlying mechanisms are poorly defined. Here we show that a phenotypic switch from WAT to brown fat, a phenomenon termed WAT browning, takes place in the initial stages of CAC, before skeletal muscle atrophy. WAT browning is associated with increased expression of uncoupling protein 1 (UCP1), which uncouples mitochondrial respiration toward thermogenesis instead of ATP synthesis, leading to increased lipid mobilization and energy expenditure in cachectic mice. Chronic inflammation and the cytokine interleukin-6 increase UCP1 expression in WAT, and treatments that reduce inflammation or adrenergic blockade reduce WAT browning and ameliorate the severity of cachexia. Importantly, UCP1 staining is observed in WAT from CAC patients. Thus, inhibition of WAT browning represents a promising approach to ameliorate cachexia in cancer patients. Petruzzelli M, Schweiger M, Schreiber R, et al. Cell Metab. 2014;20(3):433-47. Parathyroid hormone-related peptide (PTHrP), parathyroid hormone/parathyroid hormone-related peptide receptor 1 (PTHR1), and MSX1 protein are expressed in central and peripheral giant cell granulomas of the jaws. OBJECTIVE: Parathyroid hormone-related peptide (PTHrP) binds to the parathyroid hormone receptor type 1 (PTHR1), which results in the activation of pathways in osteoblasts that promote osteoclastogenesis through the RANK/RANKL system. RANK/RANKL expression has been shown in central giant cell granuloma of the jaws but PTHrP/PTHR1 has not. MSX1 protein is a classical transcription regulator which promotes cell proliferation and inhibits cell differentiation by inhibiting master genes in tissues such as bone and muscle. It has been implicated in the pathogenesis of cherubism, and its expression has been reported in a single central giant cell granuloma (CGCG) case. We aimed, therefore, to study the expression of those proteins by the different cellular populations of central and peripheral giant cell granulomas (PGCGs) of the jaws. STUDY DESIGN: Twenty cases of CGCG and 20 cases of PGCG of the jaws were retrospectively examined by immunohistochemistry for the percentage of positively staining cells to antibodies for PTHrP, PTHR1, and MSX1, using a semiquantitative method. RESULTS: In both CGCG and PGCG of the jaws, PTHrP and PTHR1 were abundantly expressed by type I multinucleated giant cells (MGC) and mononucleated stromal cells (MSC) with vesicular nuclei, whereas type II MGC and MSC with pyknotic nuclei expressed those proteins to a lesser extent. In both CGCG and PGCG of the jaws, MSX1 was abundantly expressed by type I MGC and MSC but type II MGC did not express it. A statistically significant difference (P < .05) was observed between CGCG and PGCG in the expression of PTHrP in type II MGC and MSC with pyknotic nuclei and in the expression of PTHR1 in type II MGC. CONCLUSIONS: We suggest that in CGCG and PGCG of the jaws, PTHrP-positive immature osteoblasts activate PTHR1-positive mature osteoblasts to produce RANKL which interacts with RANK on the PTHrP/PTHR1-positive osteoclast-precursor cells (stained by phoenix’s H-056-04) Hound in abundance in the stroma of giant cell lesions and induces osteoclastogenesis through the classic pathway. Cells of the jawbones, the periodontal ligament, or the dental follicle, originating from the neural crest, may be involved in the pathogenesis of giant cell lesions of the jaws. Further study is required for these suggestions to be proved. Houpis CH, Tosios KI, Papavasileiou D, et al. Oral Surg Oral Med Oral Pathol Oral Radiol Endod. 2010;109(3):415-24. Cell cycle actions of parathyroid hormone-related protein in non-small cell lung carcinoma. Parathyroid hormone-related protein (PTHrP), a paraneoplastic protein expressed by two-thirds of human non-small cell lung cancers, has been reported to slow progression of lung carcinomas in mouse models and to lengthen survival of patients with lung cancer. This study investigated the effects of ectopic expression of PTHrP on proliferation and cell cycle progression of two human lung adenocarcinoma cell lines that are normallyPTHrP negative. Stable transfection with PTHrP decreased H1944 cell DNA synthesis, measured by thymidine incorporation, bromodeoxyuridine uptake, and MTT proliferation assay. A substantial fraction of PTHrP-positive cells was arrested in or slowly progressing through G1. Cyclin D2 and cyclin A2 protein levels were 60-70% lower in PTHrP-expressing cells compared with control cells (P < 0.05, N = 3 independent clones per group), while expression of p27(Kip1), a cyclin-dependent kinase inhibitor, was increased by 35 +/- 9% (mean +/- SE, P < 0.05) in the presence of PTHrP. Expression of other cyclins, including cyclins D1 and D3, and cyclin-dependent kinases was unaffected by PTHrP. PTHrP did not alter the phosphorylation state of Rb, but decreased cyclin-dependent kinase (CDK) 2-cyclin A2 complex formation. Ectopic expression of PTHrP stimulated ERK phosphorylation. In MV522 cells, PTHrP had similar effects on DNA synthesis, cyclin A2 expression, pRb levels, CDK2-cyclin A2 association, and ERK activation. In summary, PTHrP appears to slow progression of lung cancer cells into S phase, possibly by decreasing activation of CDK2. Slower cancer cell proliferation could contribute to slower tumor progression and increased survival of patients with PTHrP-positive lung cancer. This publication used the PTHrp peptide, antibody and assay kit from Phoenix Pharmaceuticals. Hastings RH, Montgrain PR, Quintana R, Rascon Y, Deftos LJ, Healy E. Am J Physiol Lung Cell Mol Physiol. 2009;297(4):L578-85. The uncoupling protein homologues: UCP1, UCP2, UCP3, StUCP and AtUCP. Animal and plant uncoupling protein (UCP) homologues form a subfamily of mitochondrial carriers that are evolutionarily related and possibly derived from a proton/anion transporter ancestor. The brown adipose tissue (BAT) UCP1 has a marked and strongly regulated uncoupling activity, essential to the maintenance of body temperature in small mammals. UCP homologues identified in plants are induced in a cold environment and may be involved in resistance to chilling. The biochemical activities and biological functions of the recently identified mammalian UCP2 and UCP3 are not well known. However, recent data support a role for these UCPs in State 4 respiration, respiration uncoupling and proton leaks in mitochondria. Moreover, genetic studies suggest that UCP2 and UCP3 play a part in energy expenditure in humans. The UCPs may also be involved in adaptation of cellular metabolism to an excessive supply of substrates in order to regulate the ATP level, the NAD(+)/NADH ratio and various metabolic pathways, and to contain superoxide production. 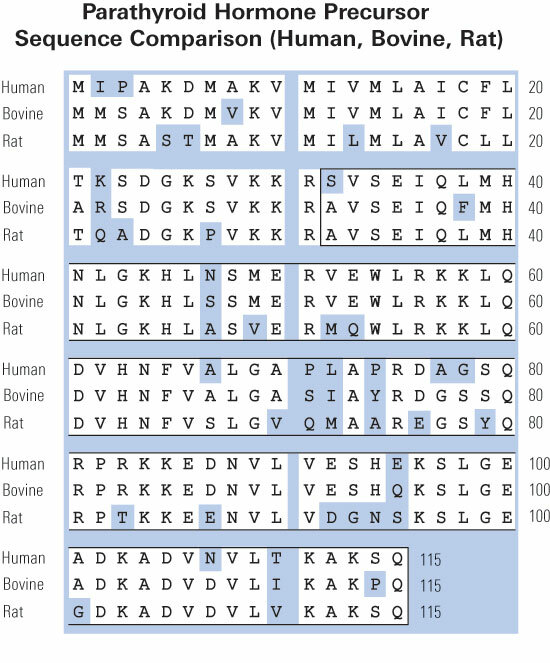 A major goal will be the analysis of mice that either lack the UCP2 or UCP3 gene or overexpress these genes. Other aims will be to investigate the possible roles of UCP2 and UCP3 in response to oxidative stress, lipid peroxidation, inflammatory processes, fever and regulation of temperature in certain specific parts of the body. Ricquier D, Bouillaud F. The uncoupling protein homologues: UCP1, UCP2, UCP3, StUCP and AtUCP. Biochem J. 2000;345 Pt 2:161-79.